Dreaming of a unique tropical island wedding? With expansive uninterrupted views of the Pacific Ocean as your backdrop paired with acres of picturesque tropical gardens, Le Life Resort offers a very unique wedding destination unmatched anywhere in Vanuatu. Whether ​its just the two of you or all of your friends and family, our experienced team can tailor a wedding package to suit your individual tastes and budget. Catering for up to 50 guests, we can organise the legalities, your wedding ceremony and reception, as well as activities and events for your guests leading up to the wedding day. 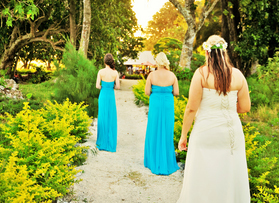 Weddings in Vanuatu are recognised in Australia and New Zealand. 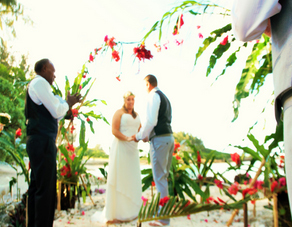 If you are after a more relaxed and tropical experience, we can provide a more stylish setting for an exquisite ceremony right on the beach. You will have exclusive rights to the venue at night for your guests to walk around the resort and take in the natural beauty. Enjoy a cocktail by the beach or mix among friends on one of our couches in the beach bar. With a tropical cuisine to match the setting, whether your wedding party is large or small we will arrange the perfect reception to celebrate the occasion. If you are after a more traditional wedding, talk to our team about organising your dream wedding. We can arrange most things at the resort but we also work in conjunction with many outside providers to make sure we can provide you with your perfect wedding day. With the seclusion and charm the resort offers, guests will need to travel 59 km from town to get to this unspoilt haven. Whether your guests are coming for the special day or for a longer stay, we can organise the transfers in style!